When I was very young, we lived in a flat at Jalan Tenteram in the St. Michael-Whampoa estate. The nearest wet market and hawker centre was probably Whampoa Wet Market near Balestier which I’d written about before. But one place which remained close to my heart is actually a row of hawker stalls located at the edge of the estate along a pathway flanked by tall and majestic looking angsana trees that leads to a large canal which separated our home and my grandfather’s just across the PIE at Kim Keat Ave. That row of hawker stalls was quite out of place really because the configuration all seemed rather makeshift in retrospect, with galvanised zinc sheets as roofs which would pitter patter noisily as heavy raindrops beat down hard during a downpour. There was just a small handful of vendors, probably a coffee and drink stall, a mixed vegetable rice stall amongst others but the one I remembered most clearly is a noodle stall that sold laksa and bak chor mee. Why did I remember it so well? Haha only because it sold one of my childhood “snacks” which my mother would occasionally allowed me to indulge on only because she loved it herself as well. Rind cracklings, otherwise known affectionately as “bak yew pok” in our colloquial tongue. It is an absolutely must in bak chor mee, and quintessential in other local hawker dishes like char kway teow and hokkien mee as well! Mum would very occasionally ask the noodle hawker to pack a small packet of bak yew pok for us to binge on the way home, while carrying plastic bags laden with piping hot soup that accompanied the bak chor mee takeaway, or my favorite from the same stall, laksa lemak. 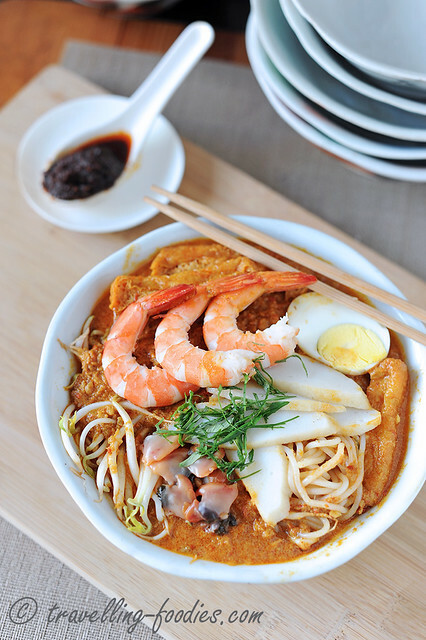 What constitutes a good laksa? well, I am no laksa expert, but merely fond memories of savouring really smackeroo bowls of laksa in my yesteryears. To me, it must be have a good balance of spiciness and all that lemak richness from the coconut milk used. But balance is more easily said than done. For the rempah, I’d used the “generic rempah” I’d prepared and used for Rendang Ayam earlier in the week. The reason I call it “generic rempah” is because it comprises of a standard set of ingredients in more or less the same proportions which most dishes that require a rempah calls for. Of course there are exceptions, but the versatility of this rempah to be used in many dishes like rendang, laksa, curries and even making achar is good enough a reason for me to prepare it in a large batch to use whatever I need and freeze the rest of it. It consists of pretty much the standard ingredients like serai, bawang merah, bawang putih, kunyit hidup, lengkwas, buah keras, cili merah and cili kering. For laksa lemak, it requires a good amount of ketumbar, belacan and udang kering as well. 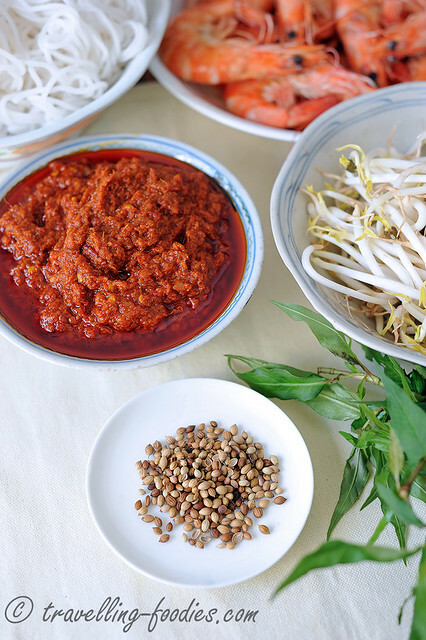 With these additional ingredients, the generic rempah is instantly transformed into one for laksa lemak! A good prawn broth is always a good start to a good laksa. I used the shells from 1 kg of medium-large prawns for the broth. That is about 30 prawns, so I cooked half of them in boiling water for a min or so first to just cook them and peeled these prawns when they are cool enough to handle. I then proceed to peel the remaining half a kg of prawns raw as I’m only going to use their exoskeletons and not their meat. I’d also taken the unconventional path to get as much out from the prawn shells and heads as possible by blitzing the prawn shells and heads in a blender with additional water before returning everything to the broth for a further simmering of 15 min. Everything was then carefully strained and my oh my, the broth collected at the end was so rich that I almost wanted to change my mind and convert it into a bisque instead! While the prawn broth was simmering, I started with the preparation of the rempah. This involved first dry frying the coriander seeds until they are aromatic beforw milling them into fine powder. The coriander powder is sifted and only the really fine powder is used. It makes a difference to use freshly toasted and milled coriander compared to storebought coriander powder. Since one has already spent so much effort to prepare all the ingredients for the rempah, one might as well go that extra mile to make sure everything is done correctly. 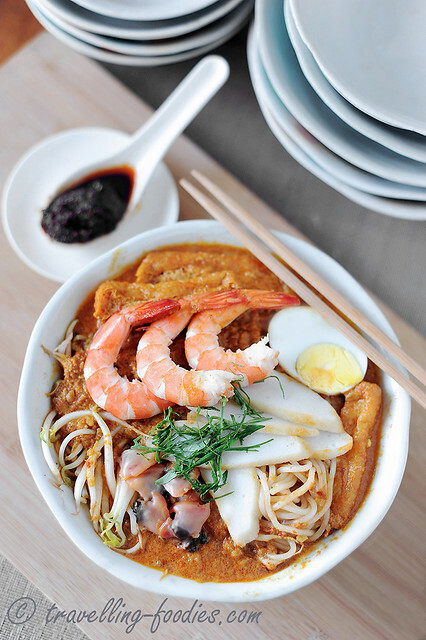 Apart from ketumbar, the other component which lends the laksa broth much of its flavour is dried shrimp. With the prawn broth made, half of the work is actually done, but for that extra boost of umami flavours, dried shrimp is added as well for good measure. I’d flossed the “prawnlets” with a food processor after giving them a quick rinse. This helps the release of flavours to occur more easily and abundantly. 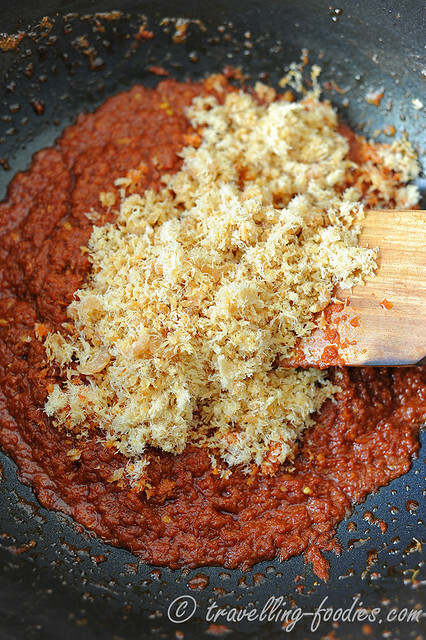 Toasted and crushed belacan is also added at this point during the sauteeing of the rempah. Cockles is yet another quintessential component in laksa lemak. 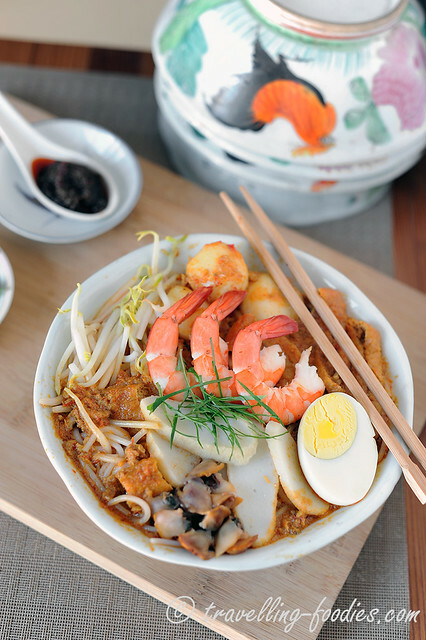 To some folks, having laksa without some “see hum” is practically unthinkable. That said, one should ensure that the cockles used are the freshest possible. That is why I always make it a point to buy them alive and whole and only shuckle them when the laksa is about to be served. Hence, those pre-shuckled ones sold in bags are not really advisable unless the source is reliable. 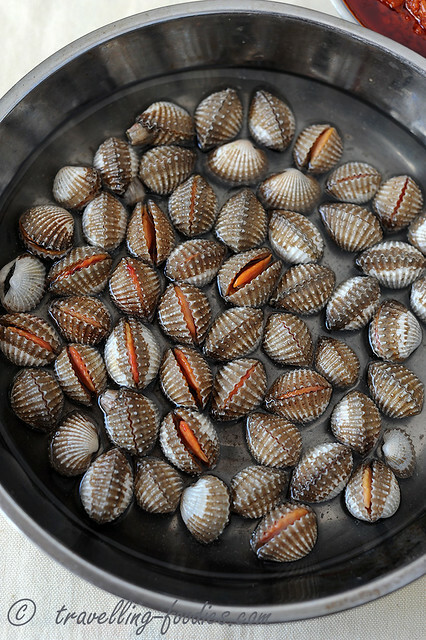 Raw shellfish goes bad really rapidly so one shouldn’t take such undue risks unless necessary. In short, always buy them fresh and eat them fresh! With everything now ready, it is laksa lemak party time! Peel all the prawns and set aside the exoskeletons，i.e. heads and shells. Retain half of the peeled prawns (500g) as laksa ingredients. Pack and freeze the other half for other recipes. In a stockpot, add 6 cups of water and bring to a boil. Blanch the peeled prawns until they are JUST cooked, i.e. when they just start to turn orange-pink and begin to curl. It takes less than a minute. Quickly strain and remove the cooked prawns onto a plate and cover with cling film. Set aside for later use. 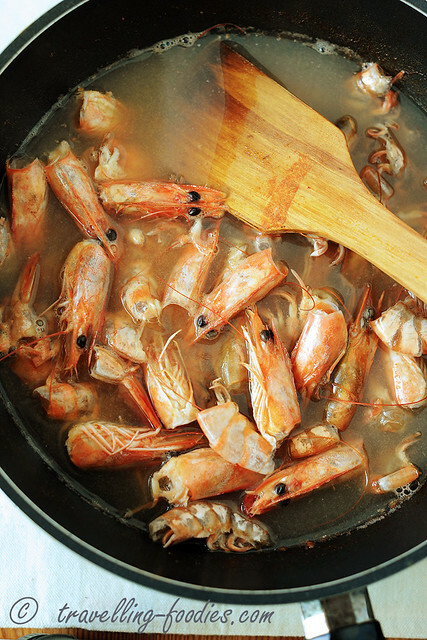 In a wok or large saucepan, add cooking oil and saute the prawn heads and shells until they turn orange. Add 2-3 ladles of the prawn cooking liquids from the stockpot to deglaze the wok and boil for 5 min. Pour everything from the wok into the stockpot. Return to a boil again before lowering heat to medium low. Simmer for 10-15 min covered. 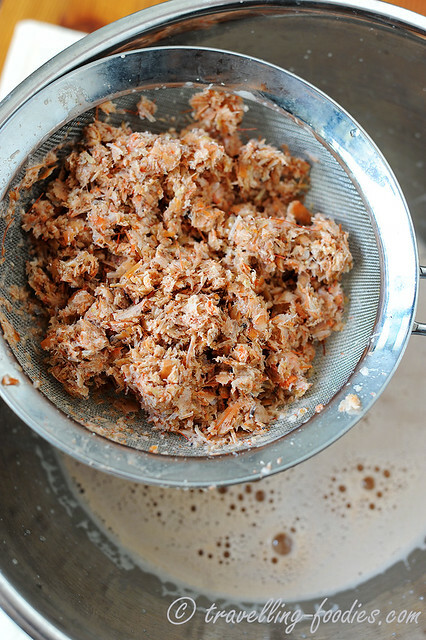 Using a sieve or slotted ladle, remove prawn shells and heads from the prawn broth and place into a food blender. Add the other 2 cups of water and blitz until fine. Pour everything from the blender into the wok of prawn broth. Bring to a boil again before lowering heat to medium low and simmer for another 10-15 min covered. Using a fine mesh sieve, strain the prawn broth to remove the blended bits of exoskeleton. Return the broth into the stockpot and set aside for later use. 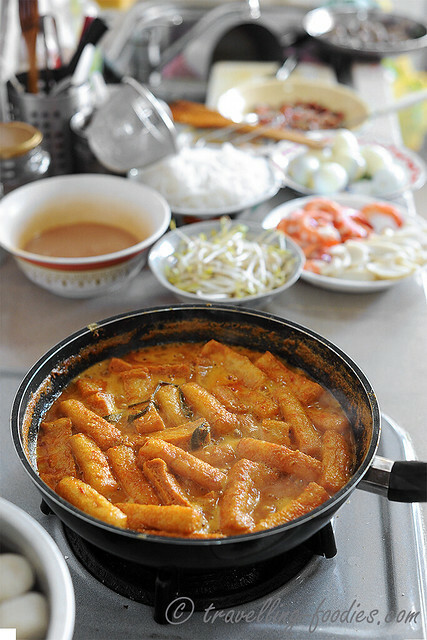 To prepare the tau pok, place all of them into a large bowl and pour some warm water over them. Allow to soak for a min or so before carefully pouring away the warm water. Give the tau pok squares a quick rinse under running tap water and squeeze as much water out from the tau pok as possible. Cut each squares into halves or thirds. Set aside for later use. Using the wok earlier, dry fry the coriander seeds under medium low heat to toast them until aromatic. Mill the toasted coriander seeds until finely powdered. 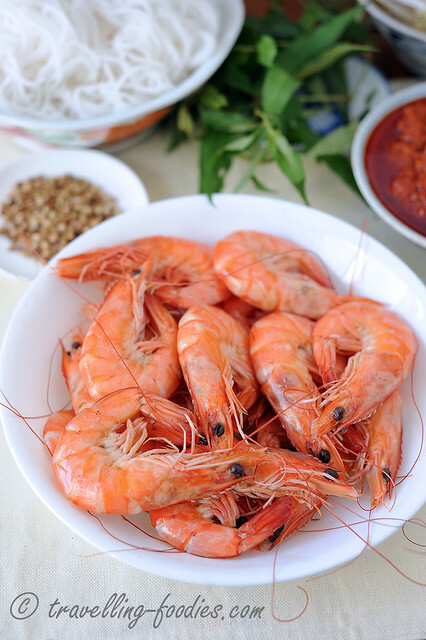 Rinse the dried shrimp briefly and process them until “serunding” floss-like texture. To the same wok, add cooking oil followed by generic rempah paste and stir fry for a min or so to reconstitute the latter slightly. Add the freshly ground coriander, belacan powder and dried shrimp floss and continue stir fry until aromatic. Add coconut milk, followed by prawn stock and bring all everything to a boil. Add the sprigs of daun kesum, sugar. Adjust the flavours with salt and top up with more prawn stock or water as needed. Add tau pok strips, fish balls and simmer under low heat for another 15-20 min and the laksa gravy is done. 2-4 sprigs of daun kesum (Vietnamese mint), leaves only finely julienned. 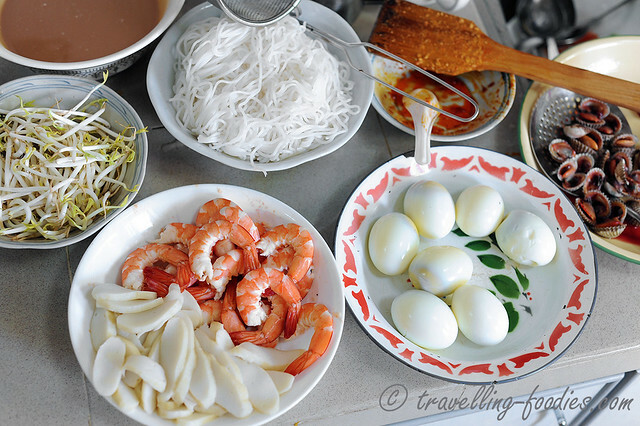 In a serving bowl, place an individual portion of blanched rice vermicelli aka laksa noodles as well as beansprouts. Ladle some hot laksa gravy onto the noodles and stir briefly before draining the gravy back into the stockpot. Arrange some fish cake slices, hard boiled eggs, blanched blood cockles over the noodles and beansprouts. Ladle sufficient laksa gravy over the ingredients to just cover the noodles. Garnish with julienned daun kesum. This entry was posted on June 22, 2014 by Alan (travellingfoodies). It was filed under Food, Simple Eats and was tagged with Baba, bean sprouts, cockles, coriander, daon kesom, daun kesum, dried shrimp, fried bean curd puffs, fried fish cakes, katong laksa, ketumbar, Laksa Lemak, melakan, Nyonya, nyonya laksa, Peranakan, prawn bisque, prawn broth, prawns, rempah, rice noodles, straits chinese, tau pok, telor rebus, telur rebus, udang kering, 叻沙, 娘惹. Whoever stays with you are lucky ones. Hi Alan, you not only write very well but cook extremely well too. The organizer of the following program should have included you so that our local fares continue live on …. A group of eight students from ITE College West’s Asian Culinary Arts course have been learning from veteran hawkers during a two-week internship which ends today. The students were thrown into the deep end at Makansutra Gluttons Bay food centre, learning how to prepare, cook and serve hawker fare. They had lessons in chopping chicken for chicken rice, stir-frying hor fun with wok hei, grilling satay and pulling frothy teh tarik. This crash course in street food is a tie-up between the Institute of Technical Education and Makansutra founder K.F. Seetoh, who runs the open-air Gluttons Bay next to the Esplanade. Wat is daun kesum? Coz if i tell ppls in market vietnam mint… hmm… i doubt.they know…. Is it common in sg? I must say your words are so apt that I can imagine the scenes before me and the dishes look and taste great. I thoroughly enjoy yr blogs. Thanks so much for sharing your great recipes and experiences.